Our extensive experience in web development allows us to handle projects from initial concept through implementation. Whether you're looking for a simple checklist tool or a complicated addition to your CRM, we've got you covered. Take a look at our finished projects in our company portfolio, where we showcase our most recent work completed. This E-Book is chalked full of helpful FileMaker Exam information. It has why certification is important, tips on how to prepare for your exam, some important study materials and pointers for when you actually take the exam. Read first-hand experiences from other FileMaker developers and utilize the resources we have compiled for you. The E-Book was super helpful. I am certified in FileMaker 9 through 11, but haven’t written the exam since. Believe it or not, reading through your E-Book motivated me to get back into it and I’m currently studying for the FileMaker 14 certification exam. I was considering getting back into it for a while, but didn’t really commit to getting back into it and fine tuning my skills until I read your E-Book. Definitely the push I needed – thanks everyone! Just finished reading the new E-Book and I must say; great job everyone. I had my developers give it a read and they loved it. Some of our guys are already FileMaker 14 certified, but they said the tips and resources are still very useful. They said they really enjoyed the real-life developer story and feedback and I really liked the chapter about the importance of certification. Thanks for the great read and be sure to sign me up for the newsletter. Cheers! 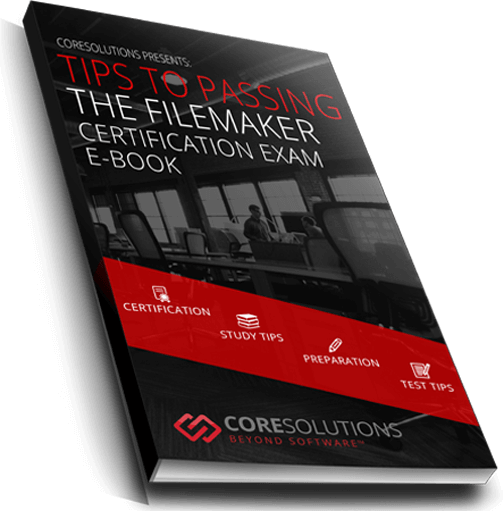 You can be assured that certified developers have the knowledge and skillset to properly develop a FileMaker solution. They have shown commitment to the platform and are dedicated to being on the cutting edge of all FileMaker has to offer. If you enjoy FileMaker solutions, blogs and news, be sure to subscribe to our Core FileMaker Newsletter! Click the 'Subscribe' button to sign up for CoreSolutions news and software tips.